Big Machine Label Group‘s President and CEO Scott Borchetta is a race car enthusiast, once living a life on track to be a great on the track. It was when he met Taylor Swift that he decided to put the brakes on and start his own record label, but he has never truly steered completely away from his original love of racing. To that end, the artists at Borchetta’s Big Machine have maintained a presence at the Indianapolis 500 (“Indy 500”) for the last several years. 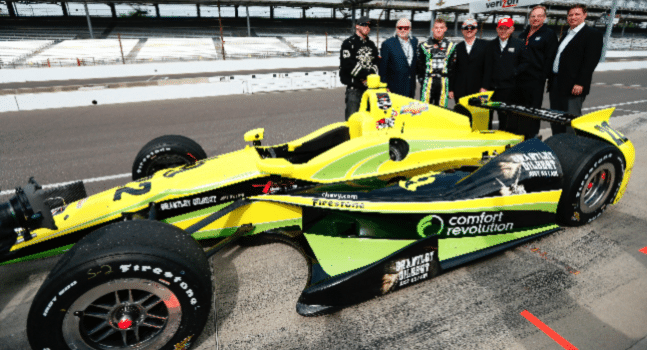 The 2015 event will include appearances by Brantley Gilbert, Florida Georgia Line, Danielle Bradbery, and Thomas Rhett, all of whom will be clad in yellow and black, sporting the #8 in support of the Chevrolet vehicle driven by Sage Karam. Bradbery is also slated to perform “America the Beautiful” during the pre-race festivities. The Indy 500 will be televised on ABC tomorrow, May 24th, beginning at 12:00pm ET. Does Maddie & Tae have beef with FGL?